Updating my websites has given me reason to update my business cards, so last week I ordered a new set from Moo. 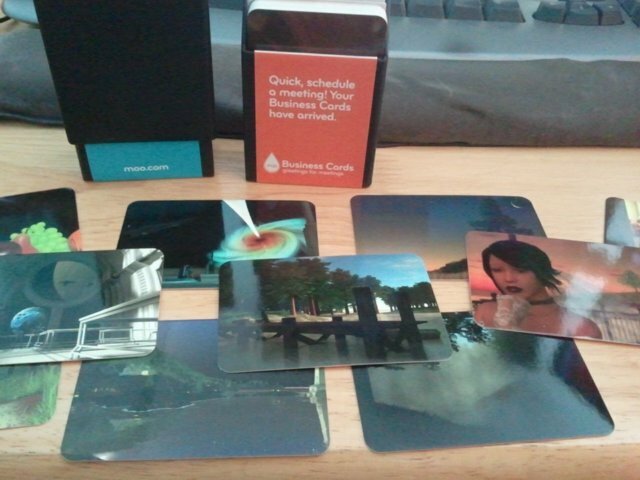 The reason I chose Moo is that they offer Printfinity — the ability to print a series of images on your business cards. I loved the idea of being able to carry and give away my portfolio, but I wasn’t so sure about the reality of the implementation. Would the cards look good and properly show off my artwork? To answer that question, I decided to bite the bullet and get some. The answer, as it so happens, is a resounding YES. I will apologize now for the quality of the photograph above; I took it with my cell phone camera. Please feel free to click on it, however, to see a larger view of the cards laid out. Ordering and customizing the cards was easy; if you’ve designed anything on the web you should have no trouble with their interface. I found it slightly disappointing that I couldn’t customize both sides of the cards; I would have loved to have had the information for each image printed on the back, along with my contact information. Even being able to vary the color of the back randomly would have been nice, but there are always limits. I chose to get rounded corner cards (as you can see in the image); I find that sharp corner cards tend to get banged up and don’t end up looking quite as nice. The cards are expensive — even with the free shipping code from signing up for their newsletter my design came out to be about $0.48 per card! That’s about 2.5x as much as the cards I’d gotten from VistaPrint, although those cards were all identical. (To be clear, the price I paid for each set was almost identical — $48-ish — but at Vistaprint I got 250 cards whereas at Moo I got 100.) Even considering the cost, I was excited; not only was I getting new cards, but they would (hopefully) be varied enough that I could use them as a talking point. The cards themselves arrived today via USPS padded envelope. Inside I found two small but sturdy black boxes; inside those, my new business cards. My first impression on holding and handling them was “did I order playing cards or business cards? !” The cardstock is thick and sturdy; it has enough weight to feel substantial, but not so much as to feel like a hunk of cardboard. The images printed beautifully, and the cards are coated with a smooth glossy finish that reminds me strongly of playing cards. (Having researched making my own playing cards I have a deep appreciation for how much work has gone into perfecting that coating; I may have a new avenue to consider now if I ever decide to design a card game.) The cards themselves are slightly wider and slightly shorter than standard business cards, but not so much as to be immediately noticeable. Overall I’m extremely impressed with the quality of the materials and the printing. I’d been a little bit hesitant to hand out my previous business cards; I have a feeling that I won’t be able to hang onto these. Bottom Line: The quality alone is probably worth the price difference, but if you’re a visual artist you just can’t go wrong. These cards will make an amazing impression. If you’d like to try their stuff for yourself, you can get 10% off by using my affiliate link. (Yes, I will get a small kickback if you’re a new customer purchasing through the links here.) If you’re in the Lancaster, PA area and you’d like to see my cards, feel free to drop me a line. I’d also love to hear about your experiences with Moo in the comments below!